Record sleeves have been vehicles for pioneering graphic design since the 1960s, but in recent years the music industry has abandoned its role as a patron of innovation in favour of blandness and conformity. One reason for this is the widespread adoption of sophisticated marketing techniques: where once an intuitive spirit of adventure ruled, now the gods of the high-street and shopping-mall prevail. Second, nearly all recording artists now have a clause in their contract guaranteeing their right to control the look of their graphics. Though in some instances this has led to striking collaborative efforts, more frequently it results in mediocrity and the elevation of whimsy. It is rarely possible to recognise a record label by its packaging. Among book publishers, an easily identified house style is still seen as a desirable attribute, but the market-driven ethos of the modern record company makes this approach unusual. This was not always the case. In the 1950s and 1960s, Reid Miles endowed Alfred Lion’s jazz label Blue Note with a cohesive and confident identity that has become more famous than the music, creating an international style still used by advertising agencies as visual shorthand for hip (see Eye no. I vol. I). More recently, Vaughan Oliver has produced an innovative body of work for Ivo Watts-Russell’s indie label 4AD, and Peter Saville achieved something comparable for Tony Wilson’s Factory Records in the 1980s. ECM (Editions of Contemporary Music), a small independent label based in Munich, has been in existence for 25 years and under the guidance of founder Manfred Eicher has consistently produced sleeve designs of enigmatic and austere beauty. The label’s packaging exhibits the finest characteristics of the European Modernist tradition: minimalist sans serif typography fused with dream-like black and white photography. Ignoring design trends, the label has maintained a visual identity and stylistic voice that perfectly articulates the distinctive European aesthetic of the music. ECM is run with visionary zeal by 48-year-old Eicher from a small office above a discount hi-fi store in suburban Munich. A throwback to the days when record companies were owned by record producers, Eicher has himself produced nearly all the 500 recordings in the ECM catalogue. He defies all the rules that supposedly ensure success in the music industry, which he regards as a sort of environmental pollution. Many ECM releases lose money; only a few make a profit: ‘It was never my intention to record artists who had commercial potential, it was simply music that touched me deeply,’ Eicher claims. Among the musicians who have released recordings on ECM are Keith Jarrett, Pat Metheny, Jan Garbarek and contemporary composers Arvo Pärt and Steve Reich. Most are artists ignored by the mainstream who are inspired by the integrity and independence at ECM’s core. Pat Metheny, now signed to major US label Geffen, has said that the only criticism he received from Eicher was that he was being ‘too commercial’. 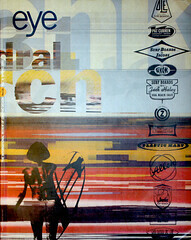 Eicher has worked with designer Barbara Wojirsch since ECM’s inception. Photographer and designer Dieter Rehm joined them in 1978, and both pay tribute to Eicher’s role in the design process. Enjoying a rare freedom unencumbered by commercial restraints, Eicher, Wojirsch and Rehm have created a body of work which, paradoxically, adheres to the rules of corporate identity and brand management, but is generated by artistic conviction and personal vision rather than commercial priorities. The sympathetic rapport between Eicher and his musicians means that they rarely interfere in the packaging of their recordings. Their views are not ignored, but most are content to let Wojirsch and Rehm work unhindered. There are exceptions: bassist Eberhard Weber insists on using his wife’s neo-primitive paintings on his covers, while Estonian liturgical composer Arvo Pärt persuaded Wojirsch, against her wishes, to create a calligraphic title for his seminal Miserere (1991). But such demands are rare and on the whole Eicher and his team are able to pursue their vision without restriction. Eicher lists the masters of European cinema – Godard, Bresson, Tarkovsky and Bergman – as having a profound influence on him, and powerful undercurrents of their work can be seen in ECM sleeve designs. He has recently directed his first film, Holozan, based on the novel Man in the Holocene by Max Frisch, with a poster designed by Wojirsch. Many of the photographs used on ECM covers – images of solitude, the sea, desolate landscapes – have a cinematic quality and they are often used sequentially in the manner of movie stills, as in Pat Metheny’s Travels (1983) and Gavin Bryars’ After the Requiem (1991). The symbiotic relationship between film and music is elegantly demonstrated in the packaging for the double CD of Greek composer Eleni Karaindrou’s elegiac music for the films of Theo Angelopoulos (1991), and the extensive accompanying booklet with its many stills. The influence of artists Jasper Johns and Cy Twombly is also detectable in several ECM sleeves. Garbarek’s Aftenland (1980) uses Johns’ stencil lettering techniques, as does Lester Bowie’s All the Magic (1983). Twombly’s densely textured crayon scribblings provide the inspiration for several of Wojirsch’s covers, including Metheny’s Rejoicing (1983) and the Hilliard Ensemble’s recording of the music of Walter Frye (1993). Wojirsch trained as a painter but gave it up when she realised that the world was full of good painters. She turned to advertising, but soon became disillusioned: ‘I can’t tell people things that aren’t true.’ When Eicher launched ECM, she found a congenial creative environment, though unlike Rehm, she remains freelance. Her work is characterised by exquisitely stark, minimalist typography based on a small repertoire of sans serif typefaces – what she unpretentiously calls her ‘careful use of lettering’. She positions photographs with the confidence of a designer not striving for effect through fashionable part-bleeds or random groupings of images: ‘It’s a picture, we choose the picture to show it, not because we want to work with it.’ Occasionally she abandons her formal type for a more painterly approach, as in her watercolour lettering for the Dave Holland Quartet album Extensions (1990). A third strand to her work is her use of hieroglyphic and runic symbols – primitive, scratchy images that impart an atavistic quality, as in Garbarek’s I Took up the Runes (1990), Jarrett’s The Cure (1991) and Anouar Brahem’s Conte de l’incroyable amour (1992). Wojirsch relishes the freedom the record cover allows; supermarket packaging and annual reports hold no attraction for her. She has little interest in computers, eschewing new digital fonts, and restricts her use of technology to the fax machine. Like many sleeve designers, she is saddened by the disappearance of the vinyl LP cover, a format that allowed her to exploit the tactile properties of board, ink and varnish at workable dimensions. Today, ECM no longer issues recordings on vinyl and some of Wojirsch’s best work is found in CD booklets, where she creates drama and tension by the dynamic use of white space and blocks of asymmetrical type, as in her designs for the recent recordings of Jan Garbarek. She readily acknowledges the influence of Jan Tschichold and strives for what she describes as a ‘purity’ in her typography. Rehm uses the Macintosh to help with typography, but without any great enthusiasm; his main interest is photography. He works with a small group of photographers who assist in his search for images that express the recurring ECM themes of solitude and beauty: the Hungarian Gabor Attalai and the Swiss Christian Vogt are ECM regulars; Eicher praises the black and white work of Jim Bengston. In recent years a more naturalistic tone has entered the photography, with less use of the cinematic drama exemplified by the Gary Peacock album Guamba (1987). ECM packaging has its critics: the champions of the new brutalism in music and graphics claim to find it anodyne, a flight from reality. Others praise the fundamental honesty of expression and independence of vision that ECM has pursued for 25 years. The best ECM covers have a presence that justifies their claim to greatness.. Through images that lead to introspection and what Eicher calls ‘the inner landscape’, they bypass the lingua franca of hype and speak in the language of psychological archetypes. There are also many ECM imitators, but like fake Rolex watches sold on street corners, they are easy to spot.